Another common complaint with computer/desk work is Carpal Tunnel Syndrome (CTS). CTS usually presents with pain, numbness, or tingling in the wrist, hand, and/or fingers. The pain usually comes on after a few minutes of typing or working with your hands. 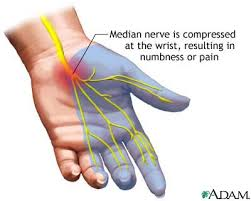 The cause of the symptoms is an impingement of the median nerve as it passes through the carpal tunnel, a tunnel made out of soft tissue in the front side of the wrist. As people type with their wrists resting on the computer/desk, the wrists are placed in an extended position which tightens the soft tissue in the carpal tunnel and impinges the median nerve. When the nerve is impinged, or pinched, the electrical signal along the nerve is disrupted which can cause the symptoms that patients with CTS experience. From a postural standpoint, CTS associated with typing can sometimes be avoided by keeping the wrists in a neutral position which maintains adequate space in the carpal tunnel for the median nerve (see our video below). Another option is using an ergonomic aid such as a wrist rest which allows you to lightly rest your wrists while still avoiding an extended position. Also, typing isn’t the only posture that can cause/exacerbate CTS. Pain in the wrist and hand is commonly linked to the cervical spine, or neck, and can therefore be affected by any activity/posture that places stress on this area including: sleeping, driving, reading, etc. If you suffer from CTS, there are some exercises which can help reduce or even alleviate our symptoms. One of the best options is called a Median Nerve Glide (video below). To perform a Median Nerve Glide, begin with your arm by your side, elbow flexed, and wrist extended. Keeping your wrist extended, slowly straighten your elbow until you begin to feel your symptoms increase, then return to the starting position. I recommend performing this exercise for 30 seconds at a time, resting, then repeating 3-5 times. You should notice your symptoms becoming less irritable, allowing you to straighten your elbow more and more each time before your symptoms begin. As always, if you continue to experience symptoms related to CTS, feel free to contact us and/or come in and see us at one of our seven locations. One of our Occupational Therapists or Physical Therapists will evaluate you and design a treatment plan structured to address your specific needs.